on a map, the shape of the union of the republic of myanmar resembles a bizarre-looking tadpole: the bulbous diamond-shaped head swimming towards bangladesh, india and china, while its tail wriggling in the company of thailand. so when i was told that my "face looks like myanmar", i was not completely amused. of course in this country, myanmar is both a proper noun and an adjective -- the word myanmarese does not exist, the old distinction between burma and burmese, obliterated. i get this reaction all the time when i travel around southeast asia, and although my accent is a little off-putting and hard to place, the color of my skin, my round dark brown eyes, my jet-black hair, and my propensity to smile all the time is characteristically southeast asian. i strengthened my resemblance to the locals by wearing the traditional lower garment worn by the men in myanmar: the pasú. it is a tube of cloth wrapped around the waist, tucked in the middle. the excess cloth forms a conspicuous bow below the belly. my motorcycle driver in mandalay taught me the technique. i was walking alone when i chanced upon a friendly man offering to drive me around town. 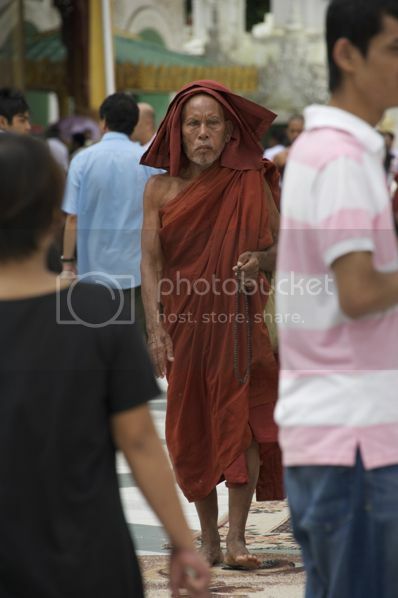 i said i wanted to go see mandalay hill and he quoted his price. i found it steep, but it was late and he was at least able to speak some english. during the ride he told me that he was mentioned in an older version of lonely planet myanmar, and i was impressed by the serendipity of it all. later i told him about my intention of wearing the longyi and he brought me to some random store where all the personnel giggled as i fiddled with the cloth. i decided to get one that was just a little more expensive than the usual plaids that i had seen men wear and the store owner said that it was the same design preferred by aung san suu kyi's national league of democracy party. i completed the myanmar illusion by allowing a friendly woman from bagan to apply thanaka on my face. when i first arrived here and saw both men and women with a cream-colored substance on their cheeks, i immediately concluded it to be some kind of powder. or possibly even clay. but when i stepped out into the dizzying myanmar heat after walking counter-clockwise around an old temple, a woman held my hand and pulled me into her store. in her broken speech i discovered what she wanted to do: put something on my face. i hesitated initially because this might mean that i would be obligated to buy something from her and i wasn't inclined: her stock of t-shirts was unimpressive. but what piqued my curiosity was how it was made. 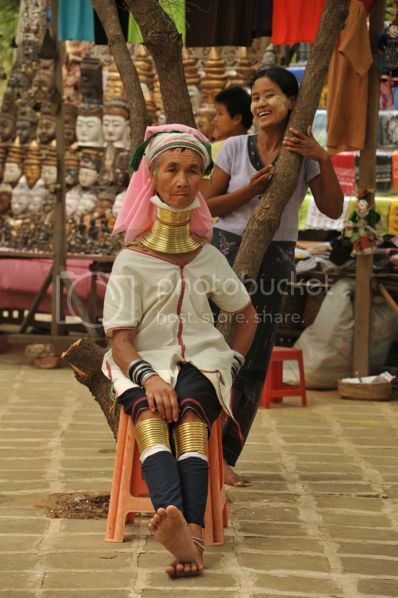 she took out her tools: a whetstone in the shape of a disc and a sweet-smelling branch from the thanaka tree. with a few drops of water and some brisk rubbing movements, pretty soon she was applying the substance on my cheeks. she explained that it was used as sunblock, and as i understand, also has some unconfirmed medicinal qualities. 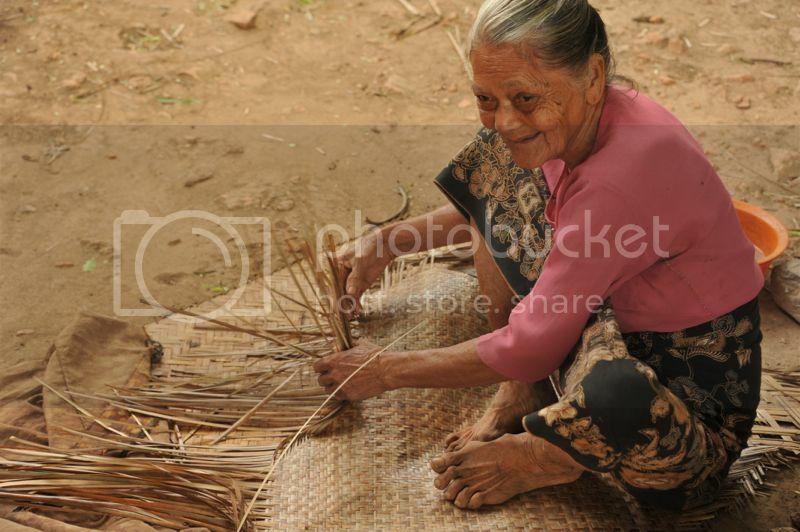 when she finished she admitted as well its cosmetic attributes by exclaiming: "handsome myanmar man!" the fact that i can pass myself off as local does have a number of perks particluarly in a nation wary of strangers. by keeping silent, i managed to visit some places for free. other visitors have to cough up entrance fees to gain access to the wonders of this nation. many of myanmar's landmarks, like the sparkling shwedagon pagoda, charges foreign visitors USD 5 to be able to enter its holy grounds. in bagan, all tourists are required to pay a fee of USD 10, which also functions as a pass to all its temples, although i noticed there wasn't one at every single temple. it might not be feasible after all, when you have over a thousand scattered in an area that spans several towns. myanmar only recently opened its doors to outsiders, and this includes both tourists and foreign investment. in previous years, following the military junta's crackdown on pro-democracy advocates and its brutal treatment of protesters, the US and most of the developed world severed trade relations with the country and backpackers joined suu kyi in her call for a ban on tourism. when the nation was devastated by cyclone nargis in 2008, the government even refused international help. "my government is strange," so my motorcycle driver in mandalay said. he used to rent out bicycles to visitors who wanted to tour mandalay on a pair of wheels, but when the tourists stopped coming, he had to close his shop. there is wisdom in his choice of words, regardless of the fact that his vocabulary may be limited. if he were more comfortable with the english language, he might have opted to describe his government as xenophobic or excessively paranoid. but in fact, the word "strange" seems quite appropriate. it is unlike any other place i've been, and so detached from the expectations i made from reading the news. this visit was, in fact, not the first. i have been to myanmar before. when i went to hua hin with a few thai friends some years back, we crossed over to myanmar territory, on the border of what is said to be the thinnest part of thailand: only 11 kilometers across. my thai host warned me to be quiet, and i made sure to stay a distance away from the border police lest he discover that i was actually from across the west philippine sea. i have also seen myanmar from across military encampments in chiang rai, as well as the border towns that were separated by a stream. but i've never really formed an idea of the country, and my visit there only confirmed my ignorance. 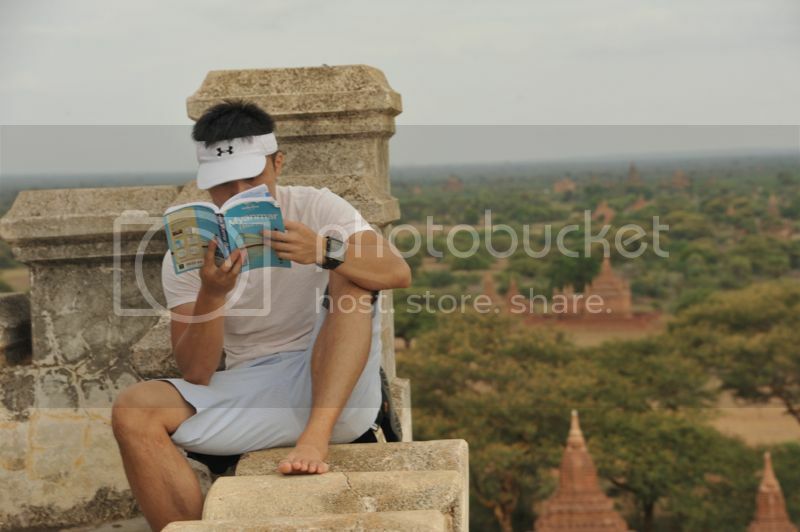 i had grabbed a copy of the latest edition of lonely planet myanmar, although i had barely read it. i merely wanted to know whether it was possible to get from one place to the next, but wasn't quite interested in flooding my brains with information ahead of the experience. sometimes, we develop itineraries and make plans based on what other people have done and what other travelers suggest that we leave little for ourselves to discover. 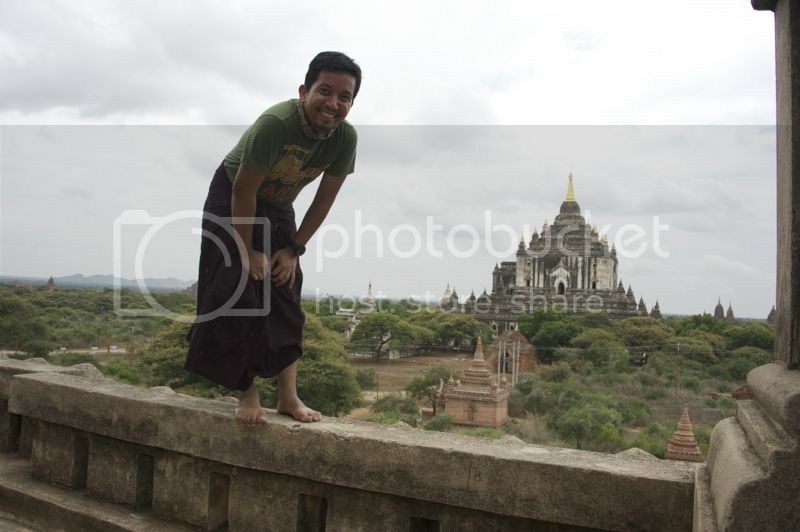 in my case, i merely wanted to go there and see myanmar through my curious eyes. i arrived in the country just after sunset, while it was furiously raining. when i stepped out of the plane, i was immediately amazed by yangon's new international airport terminal: a small, but bold statement in glass and steel of where the country plans to go. only three years ago, the airport was not there, and international flights into the country were handled by the old terminal, which is a rundown affair, resembling a sad-looking bus station. the terminal only has around 5 jet bridges and the airport just one runway: flights into the country come only from thailand, malaysia, korea, and china. the minute i picked up my luggage from the carousel, i was accosted by men in skirts offering to take me downtown. at the time, i still didn't have any kyat, the local currency, which is pronounced almost like 'chat', so i declined and took instead a free shuttle with my guesthouse. while waiting for the bus to take me to my hostel, i sat near the garbage bin. every minute, at least two men would come in to take the lid off and spit betel nut juice inside. at first i found it amusing, but since i waited for around 10 minutes, it began to feel a little disgusting. i boarded the minibus to motherland inn with much delight: it was a vintage bus straight out of the 60s, which gave the distinct feeling you'd be riding with either cattle or chicken or both. the road going downtown was smooth. there were not that many cars, but the few of them that braved the downpour puzzled me. myanmar, unlike most nations in mainland southeast asia, drives on the right side of the road, but by my estimate, about 75% of the cars are right-hand drives: second-hand imports from neighboring countries. some of these vehicles are so old i no longer see them elsewhere in the world: boxy, rickety toyotas whose doors have wobbly hinges and where the cushions on the seats have been pancaked into blankets. in some cases, parts of the dashboard are missing, or there are holes on the body that allow you to see the street below. none of the taxis ever turn on their meters, and the drivers charge fixed rates depending on the distance you plan to travel in increments of 1,000 kyats. over a year ago, these are all you'd find on the rough asphalt of yangon's streets, but lately, a wave of affluence has resulted in some brand new luxury vehicles jostling for space along its unlined roads. in fact, the ride from the airport might give you a wrong impression of myanmar's most economically important city, and its previous administrative capital: we passed impressive mansions with high walls crowned with rolls of barb wire, the kind you'll find on military camps or prisons. i could not shake off the notion, while i looked out the window of that old bus, that these houses must be owned by much-loathed generals, while a majority of the population live in small boxes on old and tattered apartment buildings that rise 8 stories high, some of which have no functioning elevators. i must admit that i did not find slums or too many homeless people or beggars on the street. it may have something to do with the buddhist charity. 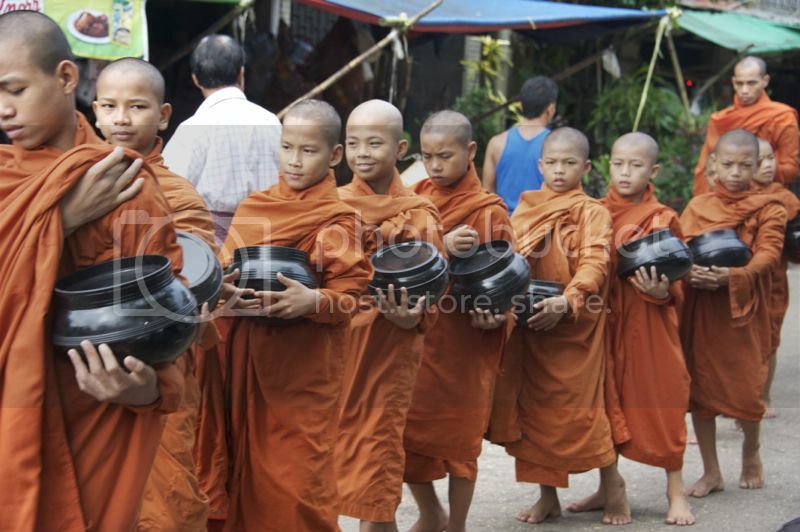 many mornings i saw queues of monks in their maroon robes lining up to receive alms without having to trumpet their poverty. 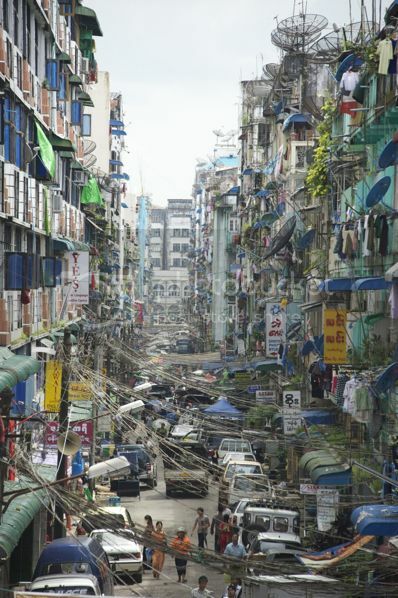 but then again yangon does not have a gleaming business district which is apart from all the rest of myanmar. the initial impression one might form from stepping into its new airport terminal changes as you go farther into the city. the centers of trade and commerce are unchanged from two decades ago. 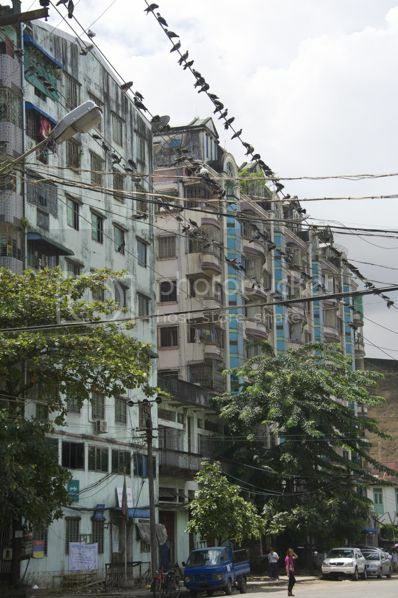 and that is why some people describe myanmar as a window into old southeast asia: while its more affluent neighbors have bulldozed dingy markets in favor of shining skyscrapers and impersonal malls, in yangon, you'd still find nostalgic flavors of a storied past. while other places are taking far too many cues from the cosmopolitan west to erase what makes them unique, yangon retains much of what defines it. that myanmar's doors are now open means that it is also on its way to evolving into something generic. but what is more frightful than becoming another blighted urbanscape is the corruption of its culture. already we see signs of tradition's decline, of greed replacing hospitality, of customs being corrupted to suit the visitors. despite the atrocities one might associate with the regime that now rules this country, inroads to becoming a true democracy are obvious. there is no more palpable proof of this than the myanmar man, woman, and child, who, next perhaps to the filipino, are the warmest, most hospitable people one would find on this side of the world. people will stare at foreigners because they are curious, not because they are planning something dastardly. despite the chaos on the streets and the sometimes frightening disorder caused by ill-mannered drivers, there is a charm about myanmar and the rough, imperfect exterior that wraps its soft and tender heart. 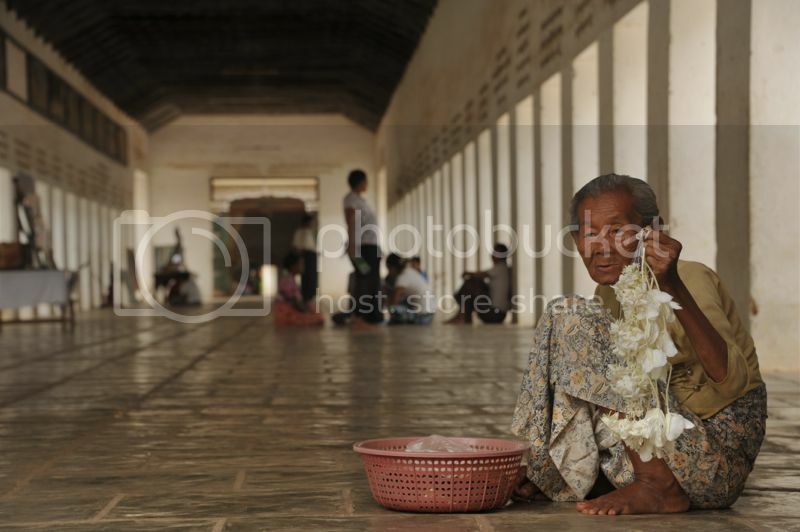 people ask me if myanmar is beautiful and i reply by asking: how do you define beautiful? if you mean organized bus routes and smooth roads that make commuting effortless or foreigner-friendly facilities to make backpacking breezy, then no, myanmar is hardly beautiful. 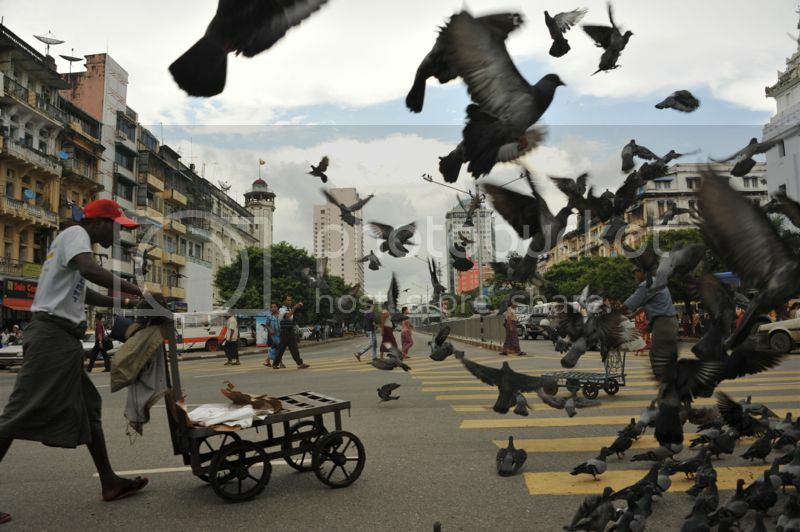 come not to myanmar for what you expect it to be, but come because it isn't any of your expectations. and come now, while few notice that its doors are swung wide open.